Romanticism versus practicality, generosity versus spitefulness, working class versus professional, Williams comes back time and time again to themes that are universal, and digs deep into the intimate nature of these women’s lives to examine them. It doesn’t matter that it’s 2016, when Bodey opines “there’s always a gossipy little group” she could be talking about life today. And Helena, describing “dinner for one”, echoes the complaints of generations of lonely people while Dottie’s relentless pursuit of physical fitness and the man she dreams of definitely rejoin concerns of modern women. Heartbreak and disappointment are inevitable. 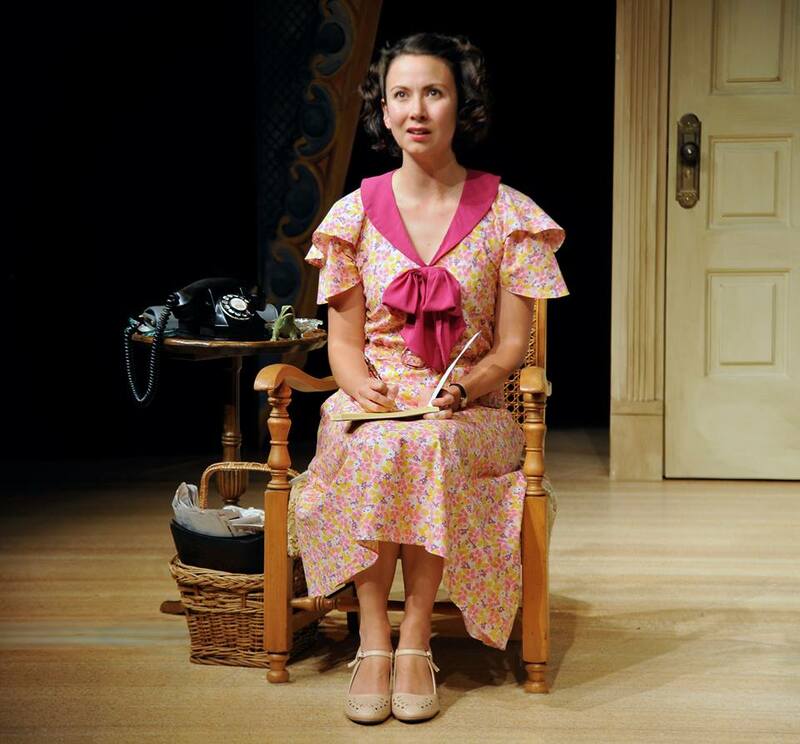 Set designer Amanda Larder, through judicious use of suspended doorways and windows, and complete working kitchen, creates the claustrophobic impression of the tight confines in Bodey and Dottie’s cramped efficiency, paying particular and faithful attention to the playwright’s descriptions. When Helena laughs at the décor, what had originally appeared charming takes on a completely different look as seen through her eyes—a sad example of the German tenements so far removed from her experience. Lighting (Marsha Sibthorpe) illuminates crucial moments of despair—Dottie sobs disconsolately under the soft haloed light in the bedroom, and Helena steps out of the action for a moment to show her true feelings. Crystal Hanson’s costumes clearly define the class distinctions—Bodey is dowdy in her house dress, Helena–crisp and elegant as if stepping off the society pages, Dottie—girlish in a gown that cost dearly and Sophie frumpy in be-ruffled peignoir. While elements of nostalgia are at play in terms of décor and household convenience, present day audiences will be grateful for societal changes sometimes taken for granted—Bodey rejoices in an extra half-Saturday off, Dottie has happily “crossed the line”, Helena arrives for a visit that is not expected. 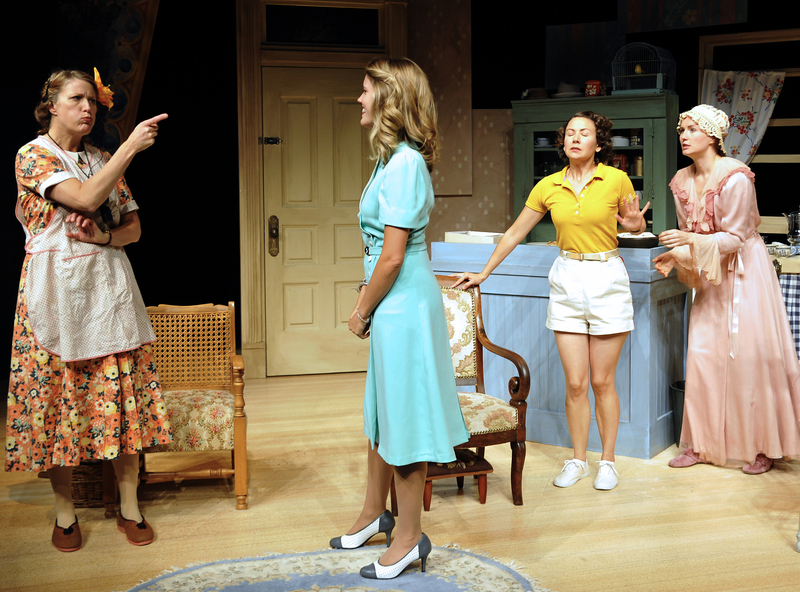 Boundaries and limits are clearly defined–a Lovely Sunday for Creve Coeur is fascinating in its exploration of how these four women test and conform to them, and in the interplay in their relationships. Director Sarah Rodgers and actors have crafted a sensitive, nuanced production that inspires viewers to want to know more, and proves, once again, the profound ability of Tennessee Williams to transcend time and place. A Lovely Sunday for Creve Coeur has a limited run. Don’t be disappointed. All is not what it seems in the Chemainus Theatre Festival’s presentation of Mary Chase’s play, Harvey, which runs until May 28. Of course, it all starts with Harvey, the six-foot white rabbit, who can apparently only be seen by Elwood P. Dowd, but the story unfolds surprisingly from there. “He’s nuts, he needs to be committed,” claim Elwood’s relatives, Veta (Erin Ormond) and Myrtle Mae (Ella Simon), but once the audience meets Elwood, they realize he’s a pretty cool guy, for all his oddities. This production welcomes the Festival’s artistic director, Mark DuMez, back to the stage in the role of Elwood, and there couldn’t have been a better choice to breathe vibrant life into the gentle fellow with the imaginary pal. All DuMez’s own well-known courtliness is a superb asset in this production; Elwood looks on the world through his own colourful kaleidescope. And colourful is a key word here. When the play begins, the set and the characters, are monochromatic, indicating subtly the sterility of their lives. The only dash of colour is supplied by Elwood with his brilliant turquoise sweater and socks. Slowly, as the scenes change, more and more colour is added to the costumes and the set as his exuberant life flows outward, warming the world around him. But no one sees it. Veta is obsessed by trying to climb the social ladder, but, in some of Erin Ormond’s best work at Chemainus, we see that she’s not as sure of herself as she hopes to portray. As her daughter, Myrtle Mae, Ella Simons is in her element, bringing all her delicious abilities in physical comedy to bear. At the sanitorium, Bernard Cuffling as Dr. Chumley, Mack Gordon as Dr. Sanderson, and Jay Clift as Duane Wilson are ably joined by Simon in her other role of the flirtatious Nurse Kelly. 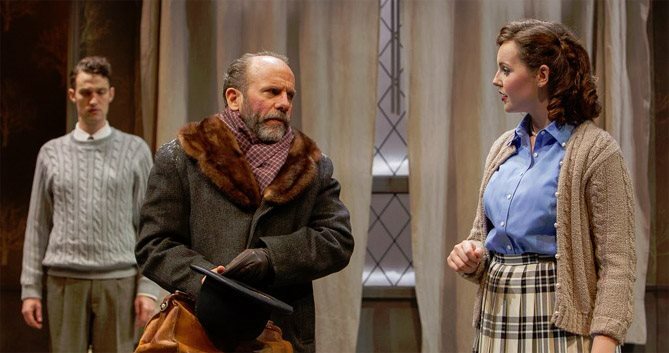 There’s an element of French farce to this play: people are whisked on and off stage through doors, but Elwood meanders surefootedly through it all without even realizing he’s in any danger. In fact, it’s his family who realize they are in danger as the play nears its conclusion, and act decisively to bring this fun evening to a surprising conclusion. DuMez talked about Harvey and playing Elwood. Older theatregoers may feel they know the story or even have seen it on TV. “They did a movie of it with Jimmy Stewart and also did a remake of the play when he was older. But the original play came before the movie; Mary Chase wrote it in the 1940s. What I’m finding is that a lot of people have a vague, or a fuzzy memory of something about a rabbit,” he said, adding that the story stands up well. The possibility of mental illness may sound a bit grim, but this is a comedy. The costumes are gorgeous and they’ve been working with two revolving sets, he said. Younger audiences who’ve never heard of Harvey, or the concept of an imaginary friend, can just sit back and enjoy the comedy, he said. The idea of having an imaginary friend can be found in many cultures, and at many times of life, but “if that friend is substantial enough in your imagination you have to question if it’s imaginary or not. That’s what the story plays with,” he said. And then, there is the utterly useless “reality” of the social climbers in the story. Wearing his artistic director’s hat, DuMez said he’s delighted with the way this season is going at Chemainus. 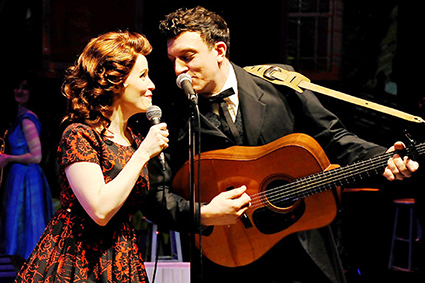 Johnny Cash (Jonas Shandel) partners for a duet with June Carter (Samantha Currie) during ‘Ring of Fire’. The show is a musical journey through the life of Cash, a country music legend. 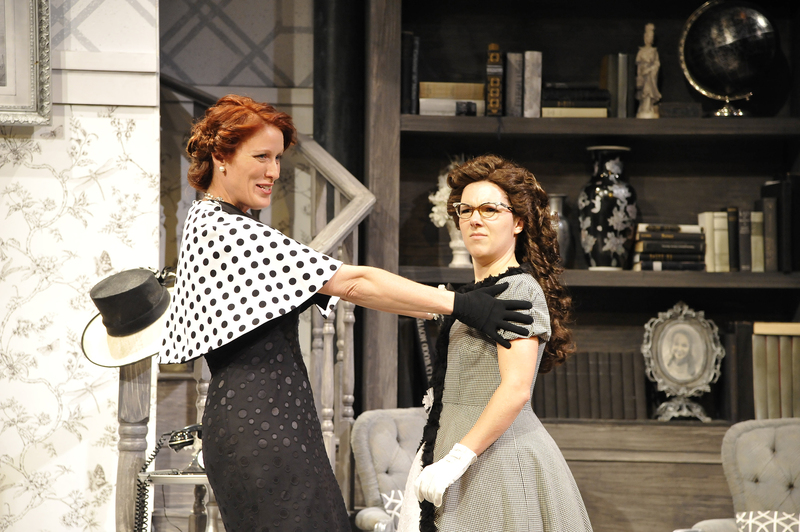 It plays April 6 to 23 at the Chemainus Theatre. The ultimate tribute to Johnny Cash will be back in Chemainus by foot-stompin’ demand. Ring of Fire runs April 6-23 at the Chemainus Theatre Festival, featuring many of Cash’s greatest hits woven together with his fascinating life story from farming to iconic superstar. 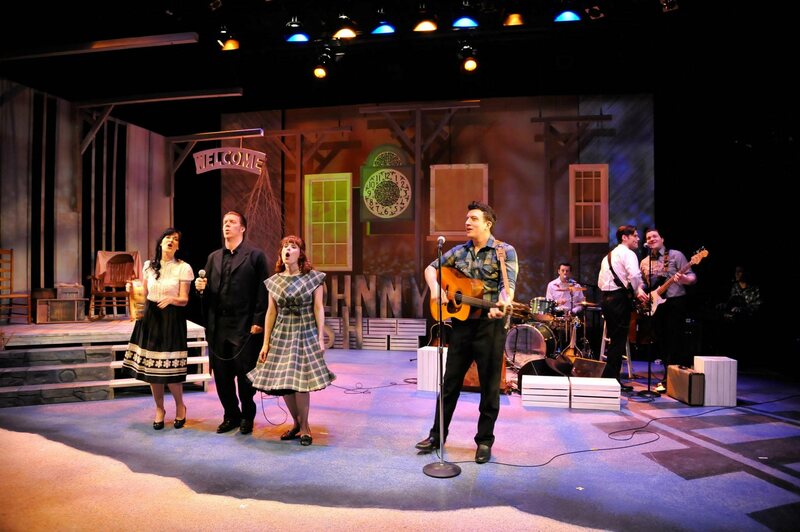 “It’s a musical journey through Johnny Cash’s life,” explained musical director Kraig Waye. The show features over three dozen Cash songs including such favourites as ‘Walk the Line’, ‘I’ve Been Everywhere’, ‘Country Boy’, ‘A Thing Called Love’ and, of course, ‘Ring of Fire’. The cast includes artists who will be familiar to the audience and newcomers to the festival stage. Performing stories and songs that were stepping stones on Cash’s journey are Alexander Baerg, Timothy Brummund (as narrator and voice of Cash when he looks back), Scott Carmichael, Andrea Cross, Samantha Currie (as June Carter), Daniel Kosub, Mark MacRae and Jonas Shandel (as the up-and-coming, youthful Cash). The show runs around two hours and has been a pleasure to musically direct, Waye said. “It’s been fantastic. This show’s a real treat,” Waye said, adding that his good friend Zachary Stevenson who directed last year’s Ring of Fire gave him a number of helpful tips in the runup to rehearsals. “I’m putting a little bit of my own flavour in, but a good majority is just to stay true to Zach’s vision from last year,” Waye added. Outstanding work has also been done behind the scenes, from set/projection designer Erin Gruber, costume designer Crystal Hanson, sound designer Paul Tedeschini, live mixer Andrew Nicholls, lighting designer Rebekah Johnson, stage manager Anne Taylor and apprentice stage manager Linzi Voth. Conceived by William Meade and created by Richard Maltby Jr., Ring of Fire is a musical biography that portrays a story about hitting rock bottom and finding the faith to carry on. Ring of Fire runs April 6-23. For tickets call 1-800-565-7738 or visit www.chemainustheatre.ca. Last night I went to the theatre…or at least that’s what I was planning on doing. As it turns out, I actually went to a televised talk show and watched the amazing performances of British bands of the 60’s. I was born in the 1970’s and the music played in my home growing up was of the classical variety, so I pretty much completely missed the music of the 60’s. When I heard Chemainus Theatre was doing Twist and Shout: The British Invasion for the summer, I thought it was going to be a concert by the Beatles. Boy was I wrong. It was so much more and so much much better than I ever imagined. After a delicious dinner at the Playbill Dining Room, Jay and I headed into the theatre to await the show. I sat in my seat and was immediately transported back in time to the 1960’s. We watched real commercials in black and white for products like razors, cereal, pickles and the like. We were greeted by Roy Solomon, our hilarious and energetic host for the evening, and when the silver curtain parted and the show began, we saw none other than the Beatles, right on stage! We all started singing and clapping along with John, Paul, George and Ringo. I thought maybe it was just me, but as I looked around at the other audience members, I know I wasn’t alone. The energy in the “studio” was electric and it didn’t let up. Roy Solomon took us on an educational journey starting in 1964 with the Beatles’ arrival to the United States. Review: The British are coming… to Chemainus! The British are invading the Chemainus Theatre for a long summer run with starting on Friday, June 12 at 8 p.m. Twist and Shout takes you way back to the Swinging Sixties: to the days when mop-top haircuts and stylish mod suits and groovy new sounds gave notice that it was great to be young. Groups like the Beatles, who took the American pop and RB sounds they loved and gave them a new kick, arrived in North America. An adoring public rocketed their music to the top of the charts. Sure, 50 years have passed, but everyone still knows and loves these tunes. 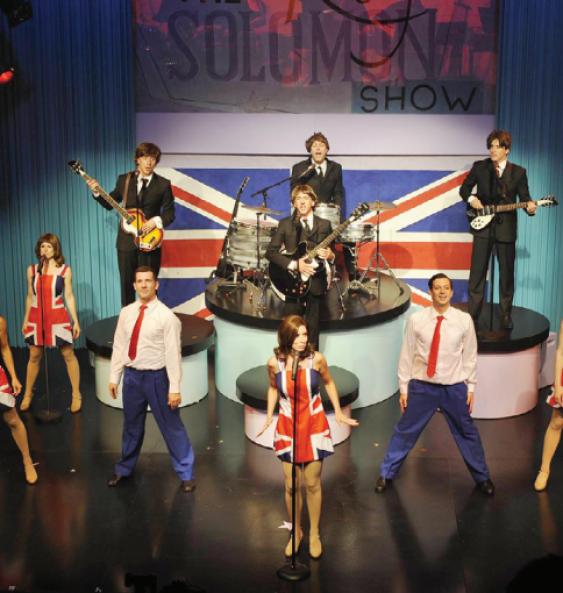 So, for a really swinging summer, the Chemainus Theatre Festival is presenting as its 2015 blockbuster musical, Twist Shout: The British Invasion, an acclaimed song and dance revue that includes 64 all-time hits, and anecdotes about the music revolution. 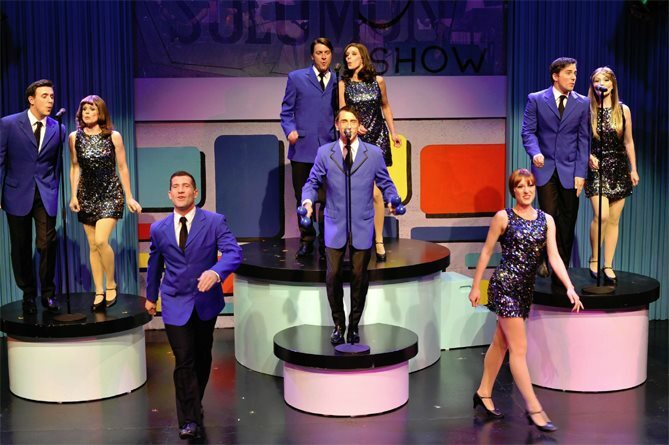 When I type “that was so much fun” after seeing the Chemainus Theatre Festival’s summer musical offering Twist and Shout: The British Invasion, I’m having to restrain myself from doing it in all capitals (shouting). What the heck: THAT WAS SO MUCH FUN! I was a little skeptical at the beginning of the theatre’s season when they announced this would be their summer show — typically their biggest production of the year. Not that a revue format with familiar tunes sounded bad, just that it was a huge departure from the last few years when they scored big hits with polished, mainstream Broadway shows like Fiddler on the Roof and Joseph and the Amazing Technicolor Dreamcoat, culminating in last summer’s amazing presentation of Les Misérables. All my doubts were swept away when I attended opening night last Friday. This show is spectacular. It has energy to burn and directs it skillfully into an extravaganza of multimedia music and comedy that’s the perfect complement to a summer night. From the blockbuster opening number that will have you dancing in your seat to the finale, the exhilaration never fades, as performer after performer steps up to the mic to front a well-known, well-loved song and blows it away. This isn’t simply a mimicry of musical greats, it’s a great cast with great voices evoking the feel of an era that not only changed music, but changed the world. Certain literary and theatrical forms recall this sense of familiarity. Agatha Christie’s play The Mousetrap, currently at the Chemainus Theatre Festival April 24-May 30, 2015 is one of the finest examples, being the longest running play in history (playing continuously on London’s West End since opening in 1952). Remember Colonel Mustard in the library with a wrench—from the board game “Clue”? If you enjoyed playing as a child, you will love puzzling out the story in The Mousetrap. 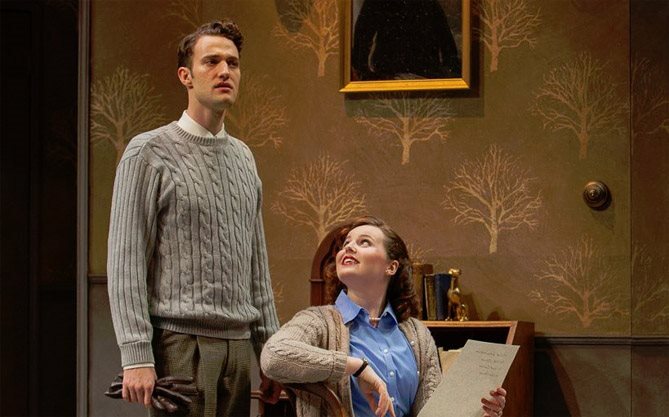 Part of the play’s charm lies in the straight delivery of the actors—this is no spoof. Christie, who based The Mousetrap on a real life case of deadly child neglect, revels in social commentary, ensuring the audience is kept guessing to the very end. And, in typical mystery fashion, a few very germane details are always left out. Newlyweds Mollie (a bubbly and vivacious Leala Selina) and Giles Ralston (Victor Dolhai as the young husband bound to please), proprietors of Monkswell Manor, have decided to open their historic home as an inn. The very first guests are about to arrive, and a snowstorm threatens. Faintly, over the radio, are overhead the details (repeated several times for effect) of a horrific murder. Titters from the audience signal the first suspicions. Perhaps I’d better pay attention. Who was wearing what article of clothing? It was old. It was black and white. And it was one of the first grown up shows I can remember watching. They were all re-runs, of course, but I didn’t care. I was learning the fine art of looking for clues and playing detective to figure out “whodunit.” Most of the time I couldn’t figure it out, but slowly I began catching on to the patterns and habits of a murderer. It was great fun for me, which is why it will come as no surprise to you to hear how much I loved Agatha Christie’s on-stage murder mystery “The Mousetrap” currently playing at The Chemainus Theatre. Every time Jay and I go to see what’s playing at The Chemainus Theatre, we are not disappointed. It took us several years to finally try it out, and I think it’s safe to say we are now sold. Everything we’ve seen has been superb and The Mousetrap was no exception. It’s a long way from the wet west coast of Vancouver Island to the hills and fields of Arkansas, and the music halls of Nashville, yet music has the power to tie us together in a celebration of family and community. Mining this fundamental truth, Chemainus Theatre artistic director Mark DuMez opens the 2015 season with Ring of Fire: Project Johnny Cash. If the enthusiastic and all-ages audience at Sunday’s matinée is any indication, Cash fans are legion. Dumez and Musical Director Zachary Stevenson (well-known to Victoria audiences for roles in Urinetown, the Buddy Holly Story, Hank Williams-the Show He Never Gave, and FIRE! ), inspired by the Broadway jukebox musical Ring of Fire, winnowed the vast catalogue of Cash hits (a massive undertaking given his nearly five decades in the music business and over 1200 songs) to a carefully chosen list of 30 titles well-known to even the most casual listener.